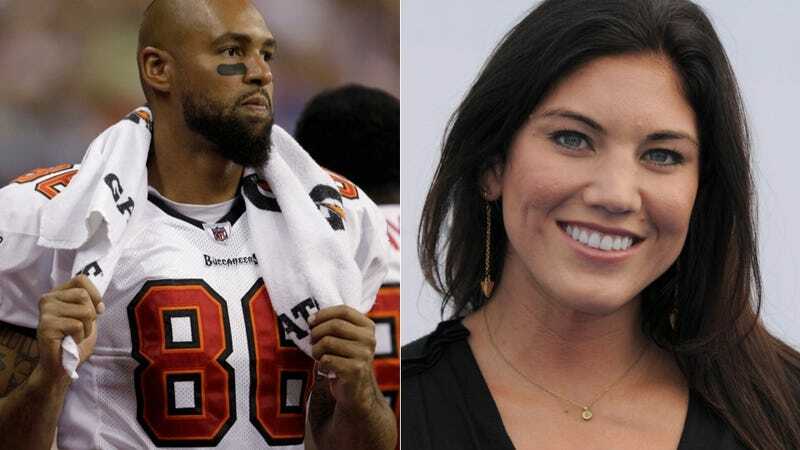 Monday night, former NFL player Jerramy Stevens was arrested for allegedly causing injury to his fiancée, soccer star Hope Solo, during a party in her house. Tuesday night Stevens and Solo got married. True love conquers all? The ceremony came roughly 24 hours after Stevens was arrested Monday night at Solo's suburban Seattle home as the couple, who had been dating for about two months, quarreled about where they would live post-marriage, according to Stevens. A former player for the Seattle Seahawks, Stevens had been arrested on a fourth-degree domestic violence assault but was not charged. He was released when a Kirkland judge ruled there was insufficient evidence. The case, however, remains under investigation. Officers noted blood on Stevens' shirt and signs of a fight. He admitted to arguing with Solo, whose elbow was injured, according to the documents. The New York Daily News reports that after the wedding, U.S. National goalie Jillian Loyden tweeted, "Happy to witness such an amazing celebration of real love." One report claims "Stevens was found lying on the floor between the bed and the wall in an upstairs bedroom. He told officers that he was sleeping and didn't hear a fight." Another report puts it this way: "Officers found Stevens lying on the floor upstairs, between the wall and a bed. He 'appeared to be hiding.'" "Several intoxicated guests refused to cooperate with police"
"Solo wasn't cooperative with police, reportedly telling her brother, 'Don't tell them anything,' according to Seattle PI." We're definitely not getting the full story here. Who knows what actually happened? Pre-wedding party, drunkenness, misunderstandings? Maybe Stevens didn't assault Solo but since he has a record — assault, drugs, DUI, felony battery, crashing into a nursing home — cops just assumed the worst? Stevens, 33, and Solo, 31, have been dating for two months. Here's wishing them all the best.